Hamble River Sailing Club : IRC Autumn Championship at HYS Hamble Winter Series? 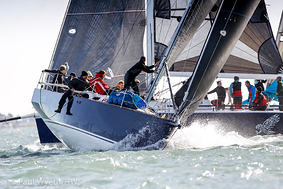 Home / News / IRC Autumn Championship at HYS Hamble Winter Series? 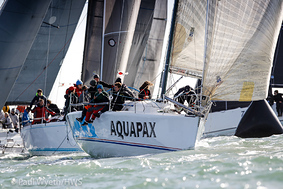 The IRC Autumn Championship took place over the weekend of the 6th & 7th October and, as anyone who was in the Solent last weekend will tell you, these were two very different days. PRO Kathy Smalley summed it up when she said "It was a game of two halves!" If you prefer musical references to sporting ones then "Wet Wet Wet" summed up the overture to the weekend. On the Saturday, Kathy, assisted by her redoubtable linesman, Peter Bateson, took up station at 4W (Goodall Roofing) and waited for the fleet to show up. Despite the rain and the building northerly, show up they did. Some 32 teams made the start area. 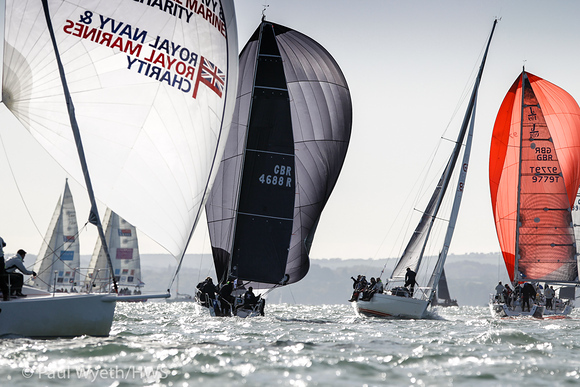 The course consisted of a cascading windward/leeward with a windward mark 8R and Solent fixed marks. 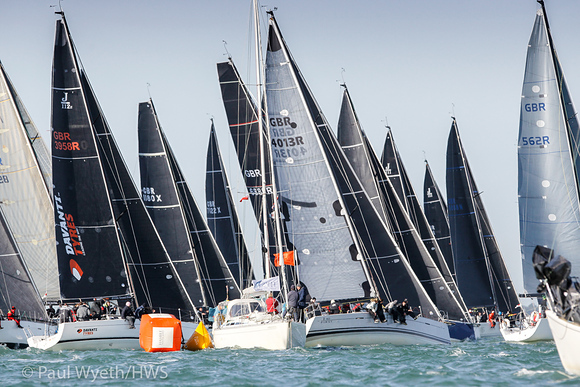 Class 1, bolstered by the Performance 40 Class in their final event of the season, started cleanly, possibly due to the lack of a discard in the IRC Autumn Championship. The race for Class1 did not go without incident however, when Expresso Martini Too, Glynn Sheffield, and Jagerbomb, Paul Griffiths collided. Expresso Martini Too dutifully retired, acknowledging her error. Sailplane, Rob Bottomley held off Rumbleflurg to win with series leader Cobra, Steve Becket, in third. The same three boats filled the podium in race two, but this time Cobra led Rumbleflurg home followed by Sailplane. In Class 2, the first race saw an epic battle between the "new" Elaine, Edward Mockeridge, Hot Rats, Robbie and Lis Robinson and Design Star 2, Roger Phillips. The pin end paid in this start and Elaine beat Hot Rats and Design Star 2 in the one, two, and three. In the second start the fleet were split as to which end paid. Lis Robinson takes up the story "Hot Rats had no line and no time left, but managed to miss the ODM to take best start." It was she added "Nothing short of a miracle." Elaine managed to bounce very professionally off the windward mark and straight into her penalty turns, but this at the cost of her second bullet of the day which she missed by 12 seconds. Jumping Jellyfish, David Richards took the race with Design Star 2 in third. In classes 3 & 4 only two boats in each class braved the Saturday conditions. Nightjar, Joe Banks had two firsts in Class 3, with Vitesse, Jon England two seconds. Two of the smallest boats in the fleet did battle in Class 4. M'Enfin? !, Chudziak and Malas won the first race from Jeffrey Dakin in the Quarter tonner Starflash. Starflash declined the opportunity to go again in Race 2 preferring to wait for Sunday's better forecast. The HP 30's raised a class start for these championships and certainly enjoyed the downwind legs. 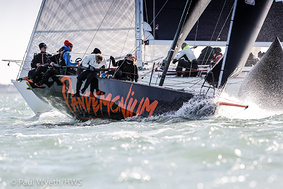 Mittens Revenge, Mikhail Tokarczyk, FarEast 28R, recorded their maximum boat speed ever at 15.6 knots. Pegasus DekMarx, Malcolm Wooton and Pandemonium, Jamie Rankin both had a first and a second to lead at the end of day one. With the conditions worsening in line with the forecast the race team displayed AP over A and sent everyone home for the day. There was a suggestion that a lack of gas, and therefore hot drinks on the committee boat had something to do with the decision, but this has been dismissed as Fake News! Day two, or the second half, dawned with beautiful conditions and 10 knots of breeze from the North. Once again, the committee boat set up at 4W. There was plenty of tacking and gybing in evidence on the beats and runs indicating some well set windward/leeward cascades on the west going tide. The improved weather brought some 52 boats out to play. John Noe, La Nef IV, declared "We had perfect light weather sailing!" With a 4th and a 3rd on day two he may regret having tried to keep La Nef IV on station as finish boat on day one instead of sailing. Nightjar and Vitesse with a big advantage from day one ended comfortably 1st & 2nd. Scarlet Jester, Jamie Muir, despite two bullets could not do better than 3rd. 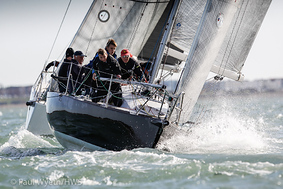 Still, two 1st's will stand him in good stead for the main HYS Hamble Winter Series, for which the Sunday was day one. M'Enfin?! and Starflash had a similar advantage in Class 4, meaning Stan the Boat, Toby Gorman and Gr8 Banter, Ian Hanley, had to settle for 3rd & 4th. Class 4 were greatly relieved that they were shortened to 4Q (Robin Culpan) in Race 4 so that the bigger boats teams didn't make it to the bar first. The big battles for the top places were in Classes 2 and 1. Three boats ended tied on 14 points in Class 2 and countback gave the win to Jumping Jellyfish. Elaine was second and Designstar 2, third. Hot Rats had to count an 11th place in the last race to end 4th – no miracles on a Sunday it seems. When your correspondent wrote in the event preview that Elaine would be hard to beat as usual, skipper Ed Mockridge declared "Big claim considering we haven't even raced the boat yet…" Ed, I rest my case. Having behaved themselves so well in races 1,2&3, Class 1 took their time to work out how to get Race 4 under way. Barney Smith on the front end of the committee boat explained that "a couple of general recalls and a Black flag restored order!" The lighter airs on day two seemed to mix things up a bit. Both Cobra and Sailplane suffered a bit whilst Nifty, Emilly Bowden-Eyre and Rumbleflurg had a bullet each, to leave Rumbleflurg in 1st with Nifty propelled to 2nd and Cobra and Sailplane 3rd & 4th. "Although Rumbleflurg won yet another Battle, it was Cobra that most certainly won the War. In the end, this ever consistent team owned by Father/Son duo Mike and Seb Blair were just too good for the opposition, winning by a relatively comfortable 6.5 points. The same could not be said for further down the podium, a tiebreak needing to separate yet another family boat in Nifty (owned by Roger Bowden who sails with daughter's Emily and Jess) and Rob Bottomley's Sailplane. Both Nifty and Sailplane finished on 19.5 points for the season, while it was Nifty's 3 regatta wins early in the season that broke the tie. " Malcolm Wooton in Pegasus DeMarx had a comfortable victory in the HP30 Class, claiming three 1st places and a 2nd. Pandemonium, Jamie Rankin was second with MOFO, Joe Hall in 3rd. The Bugle presented the Sunday day prizes in a packed HRSC. Next week the HYS Hamble Winter Series continues along with the Hamble Big Boat Championship and the Hamble One Design Championship.